SOFT Australia - Can You Help Us? It is very important for the people involved in S.O.F.T. Australia that we share information and support those who need it without cost to the individual. We feel strongly that this is a very stressful and costly time and that we do not need to add to the problems by charging for what amounts to essential information for the family. Consequently we rely greatly on donations, the giving of time and money by those individuals involved in S.O.F.T. Australia. And also fundraising activities that individuals hold. Below are details about how you can send a donation directly to SOFT Australia. There are also many other ways that you can help SOFT. Please browse through the lists, many are available at no cost to you. We have also included a wish list of things that S.O.F.T. Australia need assistance with and any help that you can give would be greatly appreciated. An extra thanks will be sent from our heart to yours the next time S.O.F.T. Australia receive a call from a family because you will have made the support that we give possible. If you make a donation to SOFT Australia these are some of the things it will go towards. Please feel free to stipulate what you would prefer it go towards. Many people make annual donations in memory of their angels. They send the money that they would have spent on a birthday gift and know that the work of their precious child continues. These very special donations will be acknowledged with a certificate to be included as part of your memories. Information Packs S.O.F.T. 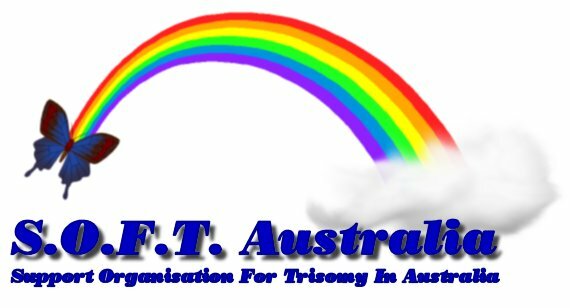 Australia do not charge families for the books about trisomy and other information that we send. However we still need to purchase the books that we give from SOFT USA and pay postage for books from SOFT UK. Each new family on average receives around $60 worth of material when they first phone. Office Expenses For office expenses such as paper, ink, telephone calls and such. No S.O.F.T. volunteer receives any payment for the work they do, however similarly many donate all the materials that they use out of their own pockets. Submission Currently S.O.F.T. Australia is in the process of preparing a submission to the NSW Government. The submission includes detailed research about the incidence and outcome of trisomy related births and asking for a policy review relating to the treatment of our children and their families as well as the resources available to them. The costs for this are quite high. For example we need to purchase international journal articles for the analysis of the incidence statistics and overseas treatment practices. Each journal article costs around $40 Australian. Research S.O.F.T. Australia is actively involved in and supports TRIS. TRIS or Tracking Rare Incidence Syndromes is a research project aimed at tracking the longitudinal outcomes of families who have been effected by a trisomy diagnosis, including mosaicism and partial duplications. It covers both surviving children and the effects on families whose children have passed away. Domain Name / Internet We would like to have our own domain name and host so that people seeking information and assistance can find us quickly and easily. Office Equipment We are in urgent need of a laser printer and photocopy machine as well as paper supplies such as letter heads and business cards. Shop For A Cause Log on to "Shop for a Cause" and support S.O.F.T. Australia. Shop for a Cause "days" are held several times a year but you can log on now to support S.O.F.T. Australia, whether you shop on the day or not. What's the catch you ask? There is no catch! It's that simple! Shop for a Cause is really supportive of S.O.F.T. Australia and the work we do. They want to see us raise a huge amount just as we do. Cross Stitch From the S.O.F.T. Shop Would you like to make a lasting and unique memory of your precious ones? SOFT Australia are able to turn your favourite photograph into a beautiful detailed cross stitch which can then be framed, turned into a cushion or anything that would make it special. The larger the cross stitch the more detailed it is. It is the perfect way to make a lasting memory of your special trisomy angel. For More Details Click on the Cross Stitch and also to visit the S.O.F.T. Shop for more great special memory ideas. S.O.F.T. Shop has many other small mementoes to help remember your special one. There are many other ways that you can help support S.O.F.T. Australia. Below are a few ideas. Contact Karen at S.O.F.T. for details our fundraising certificate. Raffles We can help you organise a raffle that you can run in your local area. Prizes, books and everything can be arranged - all you need to do is sell the tickets. Chocolate Drives, Garage Sales, Dinners, Dances. You could even let your other children get involved by holding events at their local school. For example one 11 year old organised a mufti day to raise monies for S.O.F.T. Australia in memory of her brother. S.O.F.T. Australia is always in need of people to help. Below are a few positions that we desperately need assistance with. However if you have your own special skill and would like to help, please call. Accountant / Auditor S.O.F.T. Australia do not handle a lot of money, however we are a registered not for profit group and consequently need to file all the paperwork. Help from someone who knows what they are doing, or who is willing to learn woudl be GREATLY appreciated. Australian Tax Office Tax Deductibility Number Currently S.O.F.T. Australia is a registered not for profit group however we have been unable to afford the time to tackle the maze of applying for and receiving charity status with the Australian Tax Office. Newsletter Editor Our quarterly newsletter is currently without an editor. We DESPERATELY need someone to help us out in this regard. Researchers We need people to do many different things in this area - eg to compile a list of all the hospitals in an area, special needs schools and such to help us let people know that we are here to help. Fundraisers We are always in need of people to help us co-ordinate fund raising events and ideas. We have loads of great ideas, but need people with the time and energy to help us get them into action. Event Co-Ordinator Two or three times a year we try and co-ordinate local get togethers, we could use some energetic help to make these events happen. State and Regional Co-ordinators People who will help organise state activities, phone families and be a central contact person for calls from that state. Knitters Perhaps you know someone who likes to knit or sew? If so we would love to receive donations of premature baby clothes that we can give to families. Our children are often born very small and its very hard to find the right sized clothing when you are caught unexpectedly. Writers S.O.F.T. Australia is currently writing their own book for Australian families. We would love help in writing different sections. There are always heaps of things that need doing. If you cant find anything in the above list but would still like to help - please phone Karen. While all care has been taken the information contained in this web site is not written by a medical professional and as such should not replace the valuable and personal information of your own health care professionals. SOFT does not promote or recommend any specific therapy, treatment or course of action. SOFT is an independent organisation and does not support any particular political or religious point of view. Individuals or organisations referred to, do not necessarily endorse this publication or the views of SOFT.